Posted on Monday, September 22nd, 2014 at 1:41 pm. Rose gold has been a popular colour for couples this year – especially those wanting to add a touch of luxe into their table designs. We still think this beautiful colour addition is going to be around for a while and we certainly are pleased about that! As we are heading into Autumn we can’t think of metallic shade that adds more depth and warmth to an overall colour palette, and so we encourage couples near and far to embrace the softer, more subtle tones of rose gold and incorporate it in to your day! 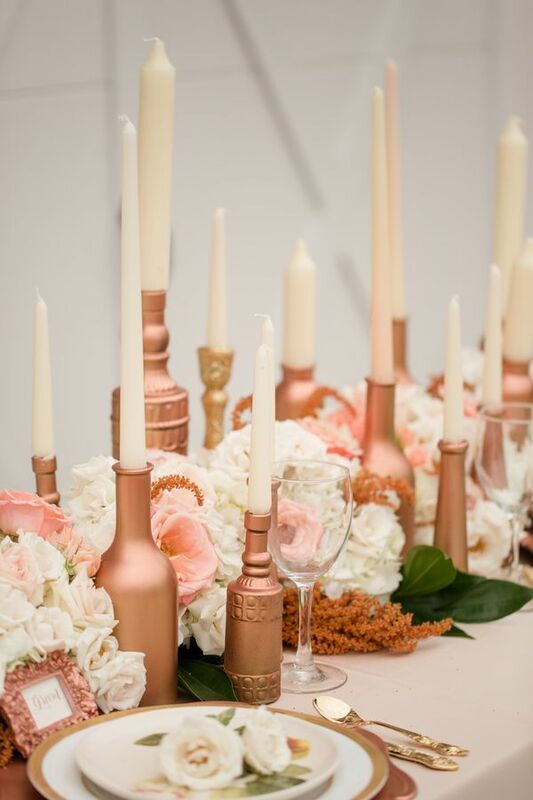 Let us know what you think of our rose gold wedding inspiration – are there are other colour palettes you would like to see brought to life? Let us know! These lovely images have been taken from the following places, they do not belong to us!